​CW2 Clint Prather was born in Cheney, Washington on October 23, 1972. He enlisted in the Army as a combat medic to serve in Desert Storm, and went on to serve his country in two more foreign wars, as well as peacetime. He was stationed at Ft Sam Houston, Texas, South Korea and Ft Gordon, Georgia, where he met and married his wife, Irene. 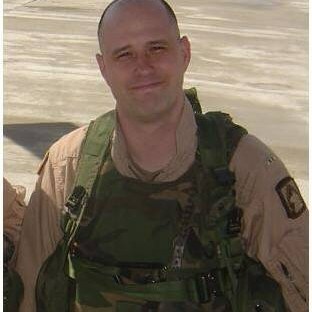 As a Staff Sergeant, he served as a Medic and was reassigned to Hawaii in July of 1999. Clint dreamed of flying, so from Hawaii he pursued a career in aviation that took him to Ft Rucker, Alabama to attend Basic Rotary Wing Training, SERE School, Warrant Officer Basic Course, CH-47D Qualification Course, and the Electronic Warfare Officer Course. ​In December of 2001, he was stationed at Giebelstadt Army Airfield, Germany, where he joined F Company, 159th Aviation Regiment “Big Windy”. He served with Big Windy in Balad, Iraq, as a Chinook pilot and as the company’s intelligence officer. One year after serving in Operation Iraqi Freedom, Clint was deployed with Big Windy to Bagram Air Base, Afghanistan, in support of Operation Enduring Freedom. Clint was a loyal and loving husband to his wife Irene, a devoted father to his kids, Aaron and Cheyenne, was a charismatic jokester and solid friend to all of us. Clint had a way of commanding a room; he could tell a joke or charade a person like no other. His gift was that he was able to do it with heart. Clint always looked after each of us in everything he did, whether it was in the cockpit, or briefing the daily intelligence information, or watching out for his family. He resonated with class. Clint enjoyed running, and spending time with his family in Germany.